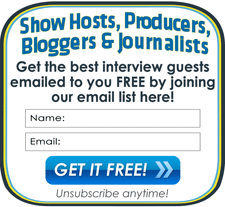 Welcome to the #1 directory of interview guests on the Internet! You’d like to make sure that YOU get the publicity interview calls instead of your competitors! We offer a variety of cost-effective and affordable sponsorship opportunities to authors, celebrities, PR firms, publicists, marketers, and experts of all kinds. What would you like to do? Banner Advertising & Custom Sponsorships: Most of our on-site ad inventory is managed by Google AdSense. If you’d like to propose something different to help promote yourself or a special product or project, just email us at the address below. Please leave us a comment below or email us at pr @ interviewguestsdirectory.com any time. What do you think? Has our advertising worked for YOU? Please leave a comment below to share your experiences!